Yesterday Vizio showed off their new range of computers which had fantastic industrial designs, but today they had some phones and tablets to show us too! Unfortunately these phones won't be coming out of the country their made, because they're just for the Chinese market, presumably because it's the fastest growing, but that doesn't mean we can't have a look at them right? The Vizio phones: Destined for China! 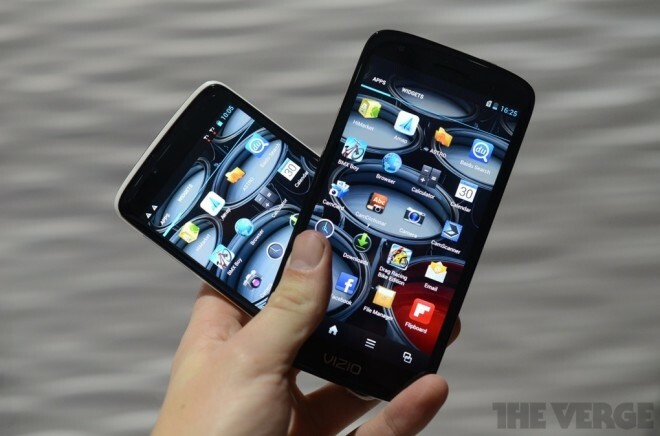 So Vizio is offering two different phones in China. One will come with a 5" full 1080p display whereas the other one will have a 4.7" 720p display. The Verge said that the 5" model “looks so good it almost feels fake” so Vizio must have put a stellar display on that device. They also appreciated the lightly-textured matte white plastic unibody on the 4.7" device, something which made it feel ceramic and somewhat similar to the HTC One X, which isn't a bad thing! As we said earlier the 5-inch device has a stunning 1920 x 1080 resolution display, an unspecified 1.5GHz dual-core Qualcomm processor, 2GB of RAM, a MicroSD card slot and Dual SIM card slots. At the moment we don't know any more of the other specs. Vizio's 4.7-inch device on the other hand has that 4.7-inch 1280 x 720 resolution screen, a1.2GHz dual-core MediaTek processor, 1GB of RAM, a MicroSD card slot and again it has the Dual SIM card option! The designs look really nice, they run relatively stock Android and it's a shame that they're not coming to the North America or Europe, but Vizio said the roll out in China is also considerably easier! We can always hope! The 7 and 10" Vizio tablets! These two tablets are both quite interesting devices too. Firstly, lets look at the 10.1" tablet because that's the real contender here and it will definitely give the Samsung Nexus 10 a run for its money! The Vizio device offers you a 2560 x 1600 display, matching the Nexus 10. Unlike the Nexus 10 though the Vizio device will be powered by a Tegra 4 processor, seeing as that chipset can push 4K we don't expect it to struggle in the slightest. The device will also have 32GB of storage, Bluetooth 4.0, Wifi, front and rear cameras, anda good range of ports and connectivity! Vizio doesn't know when the device will be available or how much it'll cost, but hopefully it should be with us by the summer! 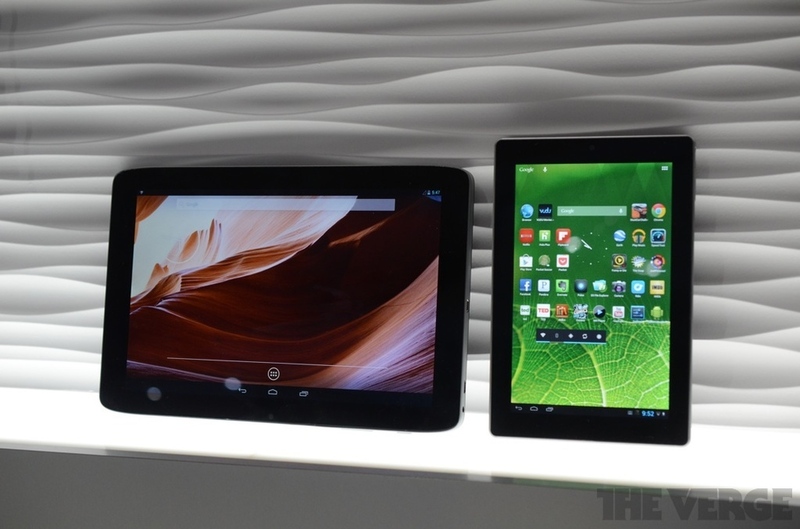 The 7" version is no slouch either and it'll go head to head with Google's Nexus 7. So to that end there's a Tegra 3 processor, a 1280 x 800 IPS display, 16GB of storage, a 1.2 megapixel front-facing camera and naturally stock Android Jelly Bean. TheVerge said that the display on this one appeared to be a lot better than the 'typically washed-out Nexus 7 display'. This 7" device is designed to be held in portrait orientation with one hand, so for that reason it is considerably lighter than the Nexus 7 despite only being a prototype. there's no final specs at this point and the design isn't final yet either, but we do know the completed device will shop with Android 4.2, which will be completely 'bone stock!